The Sahara Desert is huge. We have been in the Sonora Desert on the US border with Mexico, the Mojave Desert in California and the Okanogan Desert (the only desert in Canada) and this dwarfs them all. 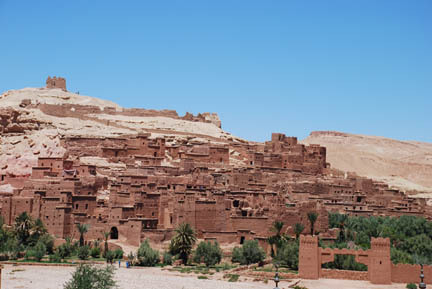 Our first stop is the Kasbah (the word means fortress) at Ait Benhaddou. You might recognize it, it has been in several movies. It is open for tours but we were hot and tired from the road over the pass and didn't feel like walking across the dry riverbed and up the hill so we stayed on the restaurant's terrace, had lunch and took pictures. 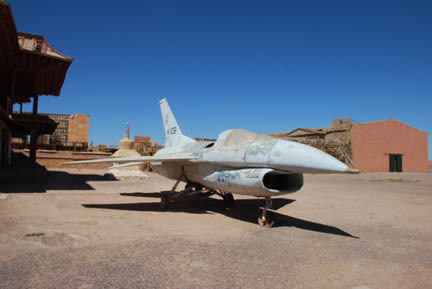 A few kilometers down the road is the town of Ouarzazate whose claim to fame is two huge movie studios. We took the tour at the Atlas Studio. We recognized many of the films including "the Jewel of the Nile". The jet featured in the movie but is a sheet metal and fiberglass mockup that was driven by a guy sitting behind, and looking out, the engine intake under the nose. Other movies include Cleopatra, Kundun, The Last Temptation of Christ, Laurence of Arabia, and many more. Several were for non-American audiences, especially French judging by the language of the title. We spent the night in the campground and talked the evening away with a German couple. They live near our friend Florian's hometown of Pentenreid in Bavaria and we discussed that area as well as Morocco. They have a large truck mounted camping unit designed to cross the desert. Someday they plan to drive all the way to South Africa in it. 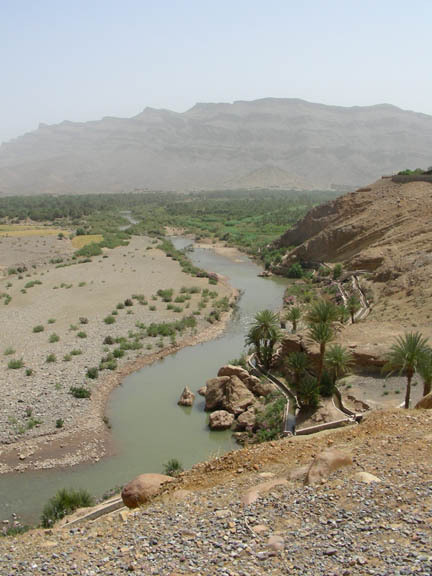 From Ouarzazate we headed south down the Draa Valley. 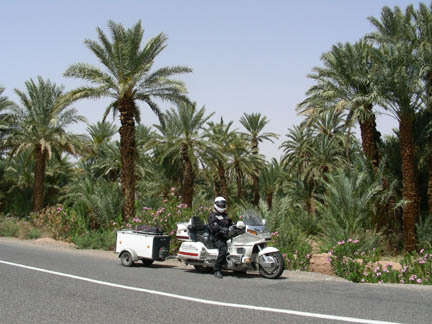 This area is famous for its date palms and as a jumping off place to explore the desert. 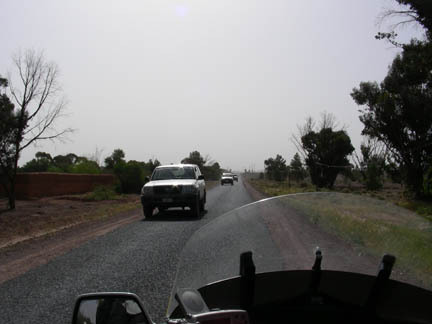 There were strings of these Toyota Land Cruisers going both directions full of tourists. 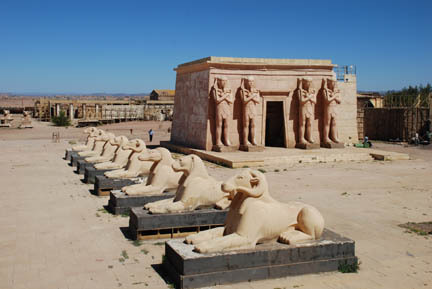 Out plan is to go to Zagora, the main "city" in the valley and visit the desert. One of the bad parts of this area is all of the plastic shopping bags caught in the desert brush. This is one of the worst areas, but they are everywhere, including blowing in the wind to who knows where. This would be a good place to ban their use. The date palms and Oleander bushes are very green along the river. Away from the river there is nothing but rock and dirt. That is not grass, those are palm trees stretching to the horizon. 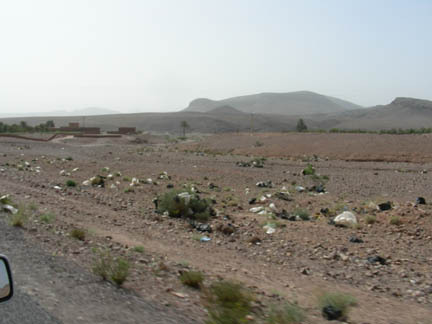 After the Berber night in the Sahara we headed east to the Horizon's Unlimited Mini-Meeting in Erfoud. 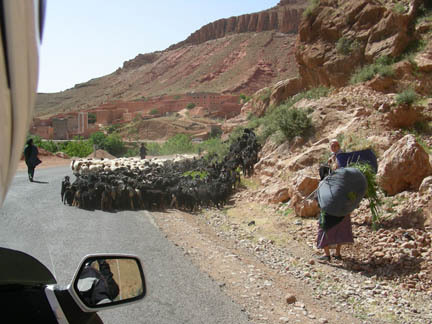 We are traveling east along the south side of the High Atlas mountains. 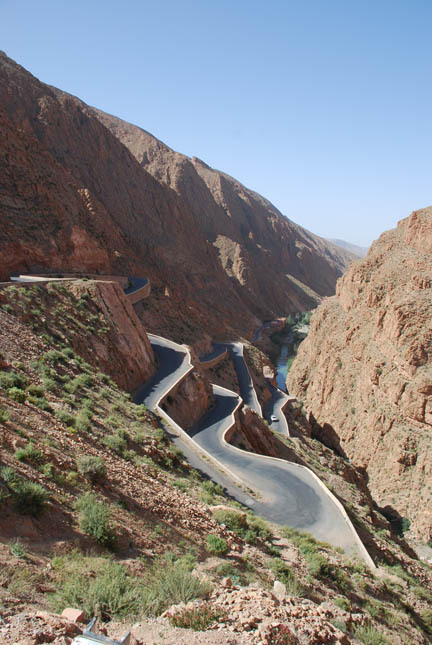 Along this highway are two side roads that go north into two gorges, the first we traveled to is Gorges Dades. 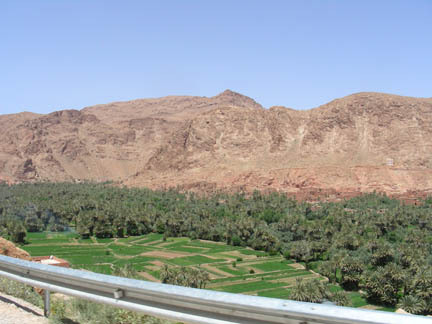 It is a fertile valley with interesting rock formations that narrows as one goes up it until you get to where the road must climb out of it. 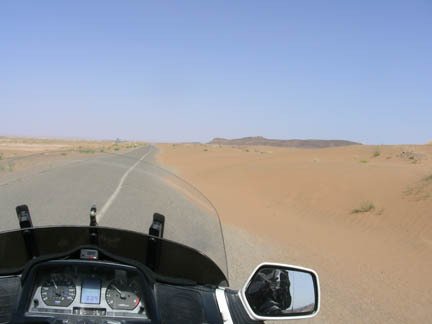 This is the destination for motorcyclists. A lot like alps roads but much shorter. Only six switchbacks. 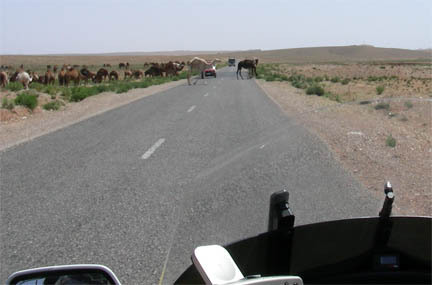 Between the two gorges we had to watch out for camels on the roads. And sheep and goats. Notice the two ladies with their packs of grass they're taking home. We saw lots of these women. We think they are putting up feed for the stock for later in the year when there is nothing growing in the heat and dry. The Todhra starts out as the typical fertile valley floor, perched villages and the parched rock sides of the area. The valley narrows and the road and the river take the same path. 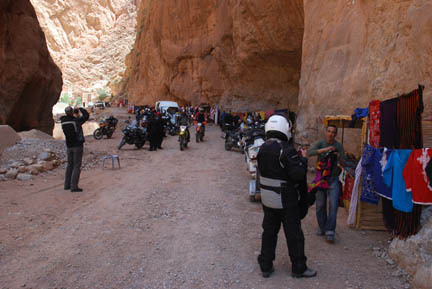 This is another popular motorcycle destination. We saw license plates from Italy, Great Britain, Australia, Morocco and our USA. 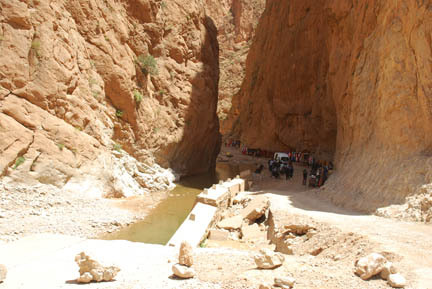 Because the canyon is so narrow it and the road follow the same path destroying the road in the process. 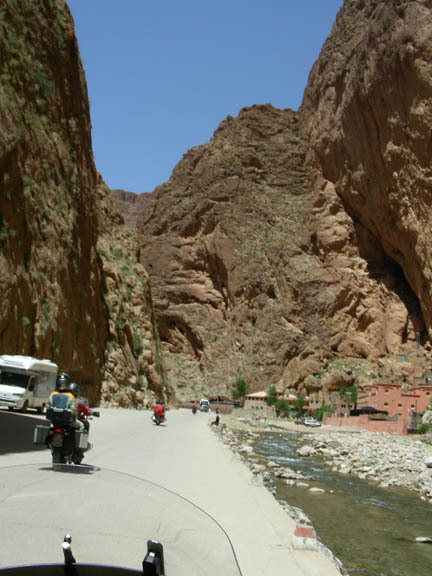 There is a piste (trail) between these two gorges that can be traveled in a day by a dual-sport type motorcycle, but not by GoldWing, especially one with a trailer. This picture shows the concrete edge of where the road used to be but is now just flattened off gravel and rock. This shady overhang with the water bubbling nearby is also the place where the souvenir salesmen hang out. We stayed two days at the Horizon's Unlimited meeting. About 20 people showed up (low for an HU event) from as far away as Australia (common for an HU event). There were talks by travelers and others about their trips, health care while riding and other topics. It was held at a very expensive hotel (unusual for a HU event) without camping. 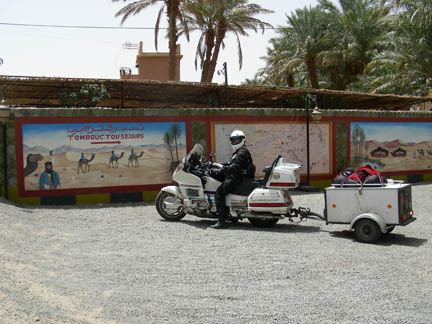 We stayed at a nearby campground (Camping Sijilmassa, 6 km north of Erfoud), others stayed in cheaper hotels and we commuted to the meeting room at the hotel. 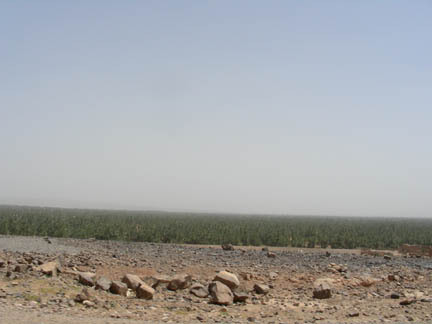 From here we head north around the east end of the High Atlas towards the Middle Atlas. There are supposed to be trees there! I've had enough desert, sand and rock. Look closely at my lane on this main highway. It is covered in sand! Thank goodness for no oncoming traffic. And the women aren't the only ones who work hard. 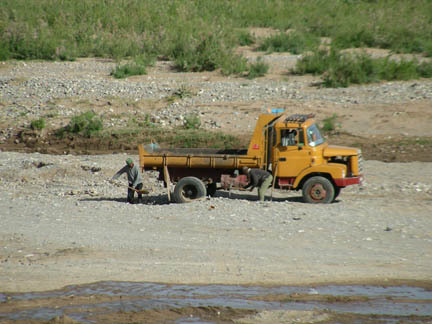 If you want a dump truck of gravel, you get a couple friends, a truck and shovels, take it down to the river and fill it yourself. This was in the noonday sun. Now on to Ifrane, a Alpine town in Morocco!